The USPS gets hip tomorrow when it issues stamps honoring Miles Davis and Edith Piaf in a joint release with the French postal service. 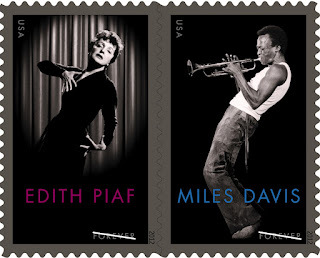 This issue continues the groove of last year's Jazz Forever stamp. Electric Miles fans will recognize the stamp's image as David Gahr's iconic photo from the cover of the Tribute to Jack Johnson album. The dedication ceremony takes place tomorrow afternoon at New York's Rubin Museum of Art. West coast cats can celebrate the release at a June 27 commemoration concert at the Hollywood Bowl led by Herbie Hancock.